A new year calls for new resolutions, not to mention new challenges and fun adventures. As a Jeep owner, you owe it to yourself to spend more time off road. 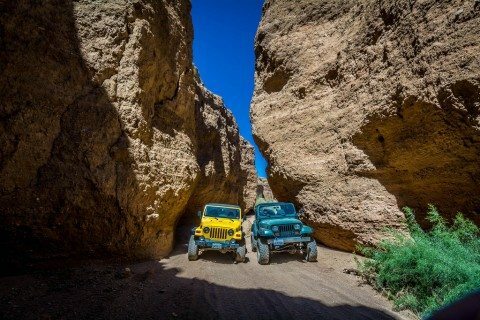 Here are 5 one-of-a-kind offroad destinations — fun places to take your Jeep (spread all across the United States) that should be at the top of your bucket list! While this list is arguably subjective and personal, based on my own experiences in my vintage CJ-7, the hope is that these will inspire you to get out and make some new off-roading memories of your own in the year ahead. The first destination on the list is actually a place I haven’t been to yet, but one that I’ve been dying to get to. If you haven’t been before, then you might want to add it to your bucket list as well. Boasting hundreds of backcountry trails in a range of difficulties, Moab Utah has become a virtual mecca for Jeep owners and other off road enthusiasts. With trail names such as “Hell’s Revenge,” “Golden Spike,” and “Cliff Hanger” (which leaves little to the imagination), thrill seekers will not be disappointed by the area’s steep descents, ledges, and off-camber obstacles. Plus, the scenery in the area is second to none, with vistas of the La Salle Mountains, Arches National Park, and the Colorado River visible from most trail vantage points. Part of western Pennsylvania’s Allegheny Mountains, Laurel Highlands offers plenty of off-road trails — for the beginning Jeep rider to the more advanced. Located about an hour and a half from Pittsburgh, the area is an easily accessible destination in the Mid-Atlantic region. Nearby Butler, Pennsylvania is the birthplace of the iconic sport utility vehicle that you and I love. There’s even a cool roadside marker: Invention Of The Jeep. Laurel Highlands is also where the annual JeepFest takes place, and where the official Jeep Jamboree at Nemacolin Woodlands Resort was held for several years. While you’re on the east coast, it’s well worth it to head to the Chattahoochee-Oconee National Forest in northern Georgia — another popular off road destination. With an extensive 4-wheel-drive trail system (850 miles, to be exact) that’s both well marked and well maintained by the USDA Forest Service, the recreation area offers plenty of offroad excitement! The Beasley Knob OHV Trail, a 10.6-mile route that offers steep drops that are not for the faint of heart. The Rocky Flats OHV Trail, a shorter, but no less challenging 5-mile jaunt which offers an advanced (but safe) riding experience with many sharp turns. I can personally vouch for both. Heading back West again, there is one particular trail in Big Sur (northern California) that shouldn’t be missed. It’s called the Old Coast Road — which was once used to connect Big Sur to Carmel, California. The trail is a 10.5-mile sand and dirt road that is both narrow and twisted and littered with boulders. The trail begins by immediately heading straight uphill before meandering though Redwoods, pine, and bay laurel, eventually offering a full view of the Pacific Ocean. Known less for its challenge, but more for its beauty and sweeping vistas of this impressive stretch of California coastline, this trail is nothing short of awe-inspiring. Last, but not least, is an area near and dear to me and my Jeep — and one that never ceases to thrill. The Oregon Dunes National Recreation Area offers 40 miles of wind-sculpted, shifting sand that is an absolute blast to traverse. If you’ve never taken your Jeep off-roading on sand before, this area is the place to try it. It’s an experience you’ll never forget! Be sure to bring a shovel in case you get stuck, and follow common-sense practices — such as mounting a sand flag on your vehicle so other drivers can see you. So, which places are on your Jeep off road bucket list? Whatever your destination, just promise me that you’ll get offroad and have fun in your Jeep this year.